Nag Champa Incense is one of the most popular incense in the world, with a rare and unique fragrance obtained from a secret blend said to contain champa flowers, sandalwood oil, spices and rare gums. 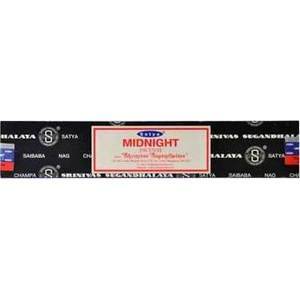 Nag Champa Midnight combines the original Nag Champa scent with a musky aroma. The natural ingredients are perfectly blended to create a sweet, long lasting yet earthly fragrance which will last for hours. Recognized as being an exceptional incense for deep calming meditation and for creating sacred spaces, Nag Champa will provide the suitable atmosphere to bring the sacred thoughts.